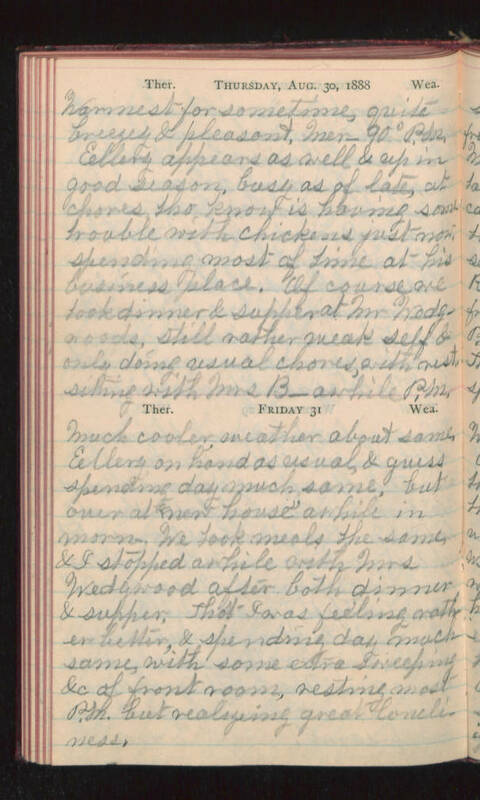 Thursday, Aug. 30, 1888 Warmest for sometime, quite breezey & pleasant, Mer- 90 degrees P.M. Ellery appears as well & up in good season, busy as of late, at chores tho know is having some trouble with chickens just now. spending most of time at his business place. Of course we took dinner & supper at Mr Wedgwoods, still rather weak self & only doing usual chores, with rest, sitting with Mrs B- awhile P.M. Friday 31 Much cooler, weather about same. Ellery on hand as usual, & guess spending day much same, but over at "new house" awhile in morn. We took meals the same, & I stopped awhile with Mrs Wedgwood after both dinner & supper. That I was feeling rather better, & spending day much same, with some extra sweeping &c of front room, resting most P.M. but realizing great loneliness.